Brother has launched a corporate printer that aims to tackle high volume print jobs by processing up to 100 pages per minute (PPM). A veritable tommy gun of the printer world, the HL-S7000DN uses a dual motor system to collect paper from its 2,100 sheet input tray before printing and moving it to an area for collection. Its maker claims that the printer can process up to 30,000 pages on a single ink cartridge using its 5,198 print head nozzles before a replacement is needed. 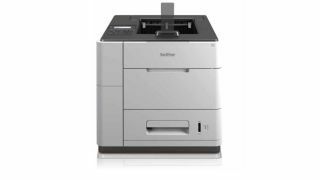 The HL-S7000DN houses an 800MHz CPU to process large print jobs, such as graphically rich documents, combined with 2GB of internal storage that can be used for storing templates. For smaller offices looking to tame this printing beast, a quiet mode reduces the speed of the machine to 70PPM, reducing sound pressure by around 10%. Brother claims that the printer keeps operating costs to a minimum using Cold Process Technology, which provides a low energy consumption of 130W while printing, with a Typical Electrical Consumption (TEC) value of 1.5Wh per week. An Automatic Duplex Printing mode means that the HL-S7000DN can create two-sided documents to save paper, and enterprise-level security operations are onboard in the form of IPsec, 802.1x Authentication (wired or wireless), SSL and Secure Function Lock. The HL-S7000DN is also ISO 117098 certified, meaning printed documents are archive-proof and readable after exposure to light, water, handling and storage.